The Monju-do Zen Fellowship is a growing community of practitioners of all sorts. This little pamphlet is a brief guide to some of the practices, concepts, and “choreography” conducted in the sitting group. This sitting group is inspired by and conducted from the Zen Buddhist tradition. It is important to keep in mind that this is not a site for proselytization or evangelization. It is a place of practice. Whether you are particularly interested in Zen or would like quiet time to begin your week, this group seeks to encourage everyone’s practice for their everyday life (gyoji). Zen Buddhism is not a philosophy, but a disciplined practice of the body and mind. Even through the great teachers in the tradition have brought to the world great insight, that insight has always been verified through the daily disciplined practice of concentrating on posture and breathing. In this way, Zen does not indoctrinate or exclude but welcomes all. It must be noted that Zen Buddhism is a religion insofar as practitioners have made a conscious life choice to practice the precepts and teachings handed down through the generations. That said, there is no worshiping of any particular deity (not even the Buddha) and only a secondary focus on spirituality. Zen practice is a “do it yourself operation.” As such, the focus is on one’s attention and dedication to posture, breathing, and stillness. Zen practice is an opportunity to quiet the mind and settle the body so that one can be in tune with the universe as a whole. Zen practice is, most properly, zazen, or “sitting concentration.” Zazen is a total body and mind experience. It requires the totality of your attention and a move beyond tensions harbored in daily life. In zazen, one settles one’s body such that the spine is straight, knees and buttocks press to the floor, and head presses to the sky. It is typical to sit in any variety of cross-legged positions; however, if you are uncomfortable sitting in the lotus or Burmese positions, you can sit in the kneeling position (called seiza). If there is a chair present, this is also an option. When sitting during zazen, your ears should align over your shoulders, nose aligned over your navel, and knees and buttocks firmly based on the floor. You should breathe at a regular pace with long, deep exhalations. 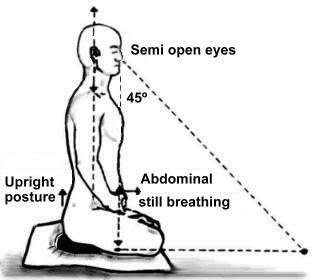 When breathing, push the breath down to your energy center, just below your navel. This region is called the Hara. 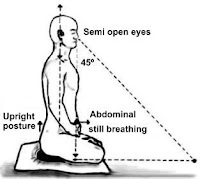 Proper breathing technique will take practice, but over time zazen breathing will happen naturally, unconsciously, and spontaneously. Finally, keep your eyes open and turned downward at a 45° angle. Keep your eyes fixed, but not focused. In zazen, nothing should be forced, yet discipline must be exerted. When sitting during zazen, one is fully open to the cosmos, to the present moment. While concentrating on posture and breathing, remain aware of your body and let go of any tension (in shoulders, back, neck, hips, thighs, etc.). While zazen is open, it is still disciplined. Keeping the posture without moving can be very challenging especially for beginners. There may be some discomfort, but do not be discouraged! Discomfort is expected. Discomfort is the mind wanting to move at a time of stillness. Discomfort, then, is a signal to persevere through the sitting period. If you feel pain, quietly adjust yourself so that you can continue practicing. While the body is still, the mind may not be so still. Thoughts arise, the temptation to daydream sets in, memories begin to play back like film. The mind moves from the past to future and back again. It moves to what could be, what is not yet, and what was. Sometimes shopping lists and work checklists pop into the mind. When this happens, come back to the posture and breathing. Place all of your effort toward mastering the posture. Your mind will quiet. Let the thoughts and images move on. Do not attach to them. Just because thoughts arise does not mean one has to “think” them. This letting go of thoughts is called hishiryo—thinking not-thinking. Through practice, the thoughts and bodily tensions will fall away. The benefits of zazen and meditation practice are well documented. During zazen, however, do not attach to the benefit or take away from the practice. Simply practice. Be attentive to the here and now and practice regularly. Just as the body changes, so do the benefits. Attaching to them will lead to disappointment or discouragement. Focusing on posture and breathing releases one from expectations, whether internally or externally, creating space for being truly present. 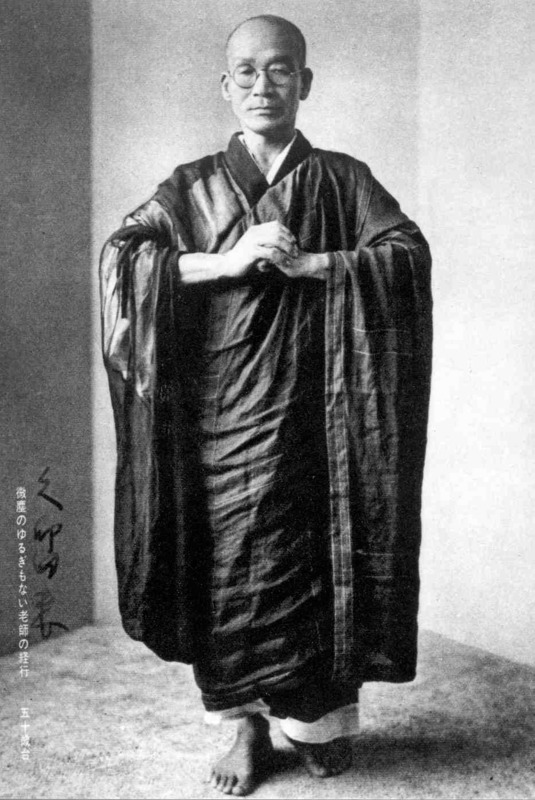 Connected to the practice of zazen is the practice of kinhin, walking meditation. This practice happens between sitting sessions to awaken the body and vitalize the senses. In kinhin, it is important that one keeps the upper body posture as in zazen. Kinhin is not a “stroll” or marching. Instead, it is deliberate, disciplined steps in stillness. During kinhin, remain erect, stepping forward. When ready, step forward. Kinhin is walking to "no-place," so do not rush. With each step forward, breathe in, and while putting most of your weight on the forward foot, pressing on the ball of the foot, breathe out in a long, slow, deep exhalation. Then take another step, breathing in. Take small, but deliberate steps while breathing normally and keeping the posture. As in zazen, the head presses the sky, and the spine remains straight. Keep the eyes at a 45° angle. When kinhin is over (usually signaled by a bell), walk deliberately back to your cushion, circling the room in a clockwise fashion. When you get to your cushion, prepare for the second session of zazen. We wish you all the best in practice!